In our commitment to make your bath time regimen as gentle and as natural as possible, we present to you 5 body washes that are unscented and paraben-free. These body washes were then ranked and thoroughly reviewed based on their gentleness on the skin, ability to remove dirt and value for money until we were able to pick out what we think is the best unscented body wash. The Pure-Castile Liquid Soap – Baby Unscented by Dr. Bronner’s should be the first choice when going paraben free. It is even USDA National Organic Program approved. It can also be used as an all-around cleanser so you’ll definitely get more of what you pay for. Acure’s Sensitive Skin Body Wash can be used regardless of your skin type. It restores and feeds cells to leave skin soft and smooth with its argan stem cells and CoQ10 components. Choose the Fragrance Free Body Wash by Jason for a complete clean without the dryness. It leaves skin smooth and soft with a unique blend of Chamomile, Aloe, and Echinacea extracts. The 3-in-1 Unscented Soap by Everyone is a true multi-tasker. Safe to be used by the entire family, it is certified gluten-free and comes in a huge pump recycled bottle. 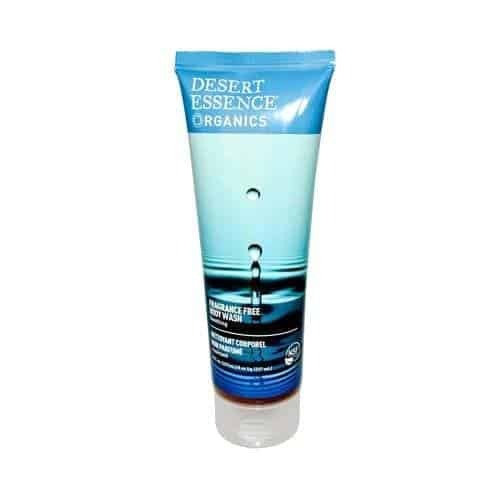 Desert Essence’s Fragrance Free Body Wash nourishes and purifies skin with Aloe and Coconut and Sugar cleansers. It also protects from external stressors with Green Tea. Before you decide, here's an indepth review of the best unscented body wash. This, for us, is the best unscented paraben-free body wash because it has everything you need in a liquid soap. It is very versatile- you’ll never run out of things to accomplish with this product. Being a paraben-free body wash means it is safe for all skin types even for people who have sensitive skin. It is safe for babies as well, but this is, unfortunately, not a tear-free formula. So, when using on your little one, pay special attention to that delicate eye area. Vegan and organic, this body wash uses a Castile liquid soap base for a deep moisturizing and nourishing effect. All natural, you are assured that none of its ingredients is genetically modified. This product is USDA-certified organic, so you are confident that nothing harmful comes in contact with your skin. It also participates in fair trade, you’re doing good for the community, too. And unlike other products that only have a 3-in-1 function, this one comes with a whopping 18. Aside from cleansing your hair, body, and face, it can also be used for your pets or the laundry. The possibilities are literally endless when you have this product in hand. Lastly, this paraben free product cares for the environment as much as it cares for you. It is guaranteed not tested on animals, and its bottles are made from 100% recycled materials. This product makes it on our list of the best unscented body washes as it provides long lasting moisturization. People with sensitive skin love it too, so you’ll never go wrong with this product. This body wash boasts of its argan stem cells and CoQ10 components. These two help bring back moisture lost by the skin, leaving you with a hydrated and fantastic feel all over. Less is more for people who have sensitive skin. This wash uses the company’s organic skincare system to give a deep, squeaky clean while offering relief from irritated, inflamed skin. Infused with nature’s best, this body wash is easily absorbed by the skin for it to get to work in an instant. The result is a boost in elasticity for a plumper and a more radiant version of you. Just like the previous product, this body wash participates in fair trade. This is a great thing because with each tube that you buy, you are in a way helping the community as well. So if that’s what you’re after, you might want to skip with this product. This product is also proudly manufactured in the USA. It is certified not tested on animals, and is 100% biodegradable as well. Having a biodegradable formula is the reason this product entered our list of the best unscented paraben free body wash. This body wash is ideal even for people who have sensitive skin. Free of chemicals, this product takes pride in its mixture of Aloe Vera, Chamomile, and Echinacea extracts. Aloe hydrates dry skin while the last two soothe inflamed and irritated skin. This body wash provides a deep clean without the risk of drying the skin out. We think that this product delivers exactly what it promises, so for that, we give it a big thumbs up. In addition to the ingredients mentioned above, this body wash also contains Vitamins B5 and E. These are added for that extra dose of moisture that your dry and flaky skin badly needs. We really love that this best unscented body wash condones animal testing. While being good for our skin, it’s good to know none of our furry friends get hurt in the process. We however didn’t like that this paraben free body wash has a high price tag. But people are still willing to spend extra bucks on this, so rest assured you’re getting what you pay for. This product made it on our list of the best unscented body washes for all the right reasons. This paraben free body wash is also a multi-tasker and can help save you some money. This product is infused with coconut-derived cleansers and botanicals, along with Vitamins B5 and E. These ingredients leave hair and skin soft to the touched and completely nourished. It comes in an unscented formulation to cater those who are sensitive to fragranced products. You can also opt to add essential oils for that scent that’ll match your mood and personality. This paraben-free cleanser comes in an economically huge bottle. It also comes in a recycled, pump top bottle which means lesser chances of wastage and better for the environment. We really love that this body wash is certified GMO-free. This is assurance that what comes in contact with your skin would cause any serious health risk. Furthermore, we love that this product does not practice animal testing as well. This makes us happy because it means animals are unharmed while testing this product out. This product makes it on our list of the best unscented paraben-free body washes as it offers a deep clean minus the chemicals. It gives out a tangy, fresh scent that’ll awaken the senses. This particular body wash comes with a gel-like consistency and works up a good lather. This paraben free product is NSF Organic Standard-certified, so you’re assured of its high quality. Infused with Coconut and Sugar cleansers, this product effectively yet gently cleanses skin without stripping off its natural oils. This is the reason it’s popular among those with dry skin. …and sensitive skin as well. On top of that, this best unscented body wash has Aloe Vera, too, to nurture and calm skin. It also contains antioxidant-rich Green Tea to protect skin from external damaging factors. As for its consistency, this product is thick and is very concentrated. This means that getting a foamy lather is not that difficult, but it might appear as a problem once it starts running out. In addition to this, what we disliked about this paraben free product is that the hole where it comes out is very tiny. This can be frustrating for some considering its consistency is too thick. But overall, we still give this best unscented body wash a two thumbs up. It’s all a body wash is supposed to be, and once you use this product, you might not consider going back. Propyl-, ethyl-, butyl-, and methyl paraben—do these ingredients sound familiar to you? They are called parabens, preservatives widely used in skincare to inhibit the growth of bacteria. But why are people suddenly becoming conscious and opting for paraben free products? The result is a rise in the demand of organic and all-natural products. Luckily for us, these products are not that hard to find whether in groceries or the drugstores. Different people react to parabens differently. However, the most common negative effect is skin irritation, and this may be for those with sensitive skin in particular. Parabens are commonly found in bath products such as shampoos and moisturizers. This may then cause some allergic reactions including rosacea and dermatitis. But it doesn’t end there. Parabens can also be present in your day and night face creams, or even in your shaving gels, toothpastes, or deodorants. When the words “paraben free” appear on a product’s label, it simply means it does not contain parabens. People of all ages can benefit from such products to avoid their negative effects. Big companies are now becoming aware of this, so they’ve made products that are paraben free for all ages. Most of these are marketed toward babies since they have the most delicate skin. As long as a product comes in contact with the skin, our advice is to always go as natural as possible. When buying products, take the time to go through the ingredients list. This is to ensure your skin does not get irritated by the chemicals it absorbs. Furthermore, paraben free products reduce the chance of hormone disruption or the chance of acquiring breast cancer. Overall, once you go paraben-free, you will greatly improve your and your family’s overall health. We’ve always stressed out how important it is to choose natural products over synthetic ones. Though natural isn’t always better, at least you’re on the right track in doing so. We chose the Pure-Castile Liquid Soap - Baby Unscented by Dr. Bronner’s as the best unscented body wash. This vegan and organic product is certified tough on dirt minus the harsh chemicals. This best unscented paraben free body wash is highly concentrated so you definitely get your money’s worth. It is also very versatile and can also be used as an all-around house cleaner. You can literally accomplish 18 different cleaning tasks with this one bottle. The best unscented body wash is here. All you have to do is check it out, and see how your overall health change for the better.